Bread Machines That Really Work. Are you tired of going through the long process of kneading, mixing, and baking your own loaf of bread at home? Do you want to try baking your own loaf of bread at home in an easier way? Then it’s time for you to buy your own bread maker! With a bread maker, you can easily put all the measured ingredients into the pan, determine the settings, and then wait for your loaf of bread to be baked. Aside from this, you can easily try variations on the basic recipe and add ingredients to your own liking! This makes bread making a lot more fun. In choosing what bread maker to buy, there are some key factors to consider. If you are a first-timer, choose something that has an easy interface. If you’re planning to use it every day, choose a bread maker that is durable. Most of all, choose the one that is affordable. With those criteria in mind, we've compiled a list of bread makers that are of good quality for every given price range. Our recommendation at this price point is the Oster 2-Pound Expressbake Bread Machine (CKSTBRTW20). The Oster is a bread maker that is known for fast baking. It weighs 8 pounds and has a loaf capacity of up to 2 pounds. It is able to make a loaf in under an hour. It is also equipped with a 13-hour programmable delay baking timer, which allows you to put your ingredients beforehand and wake-up in the morning with a freshly baked bread. • The Oster Expressbake bread maker is a very convenient choice, especially if you are a beginner. After figuring out the right proportion of each ingredient, simply combine them in the pan and set the timer. After that, all you have to do is wait. 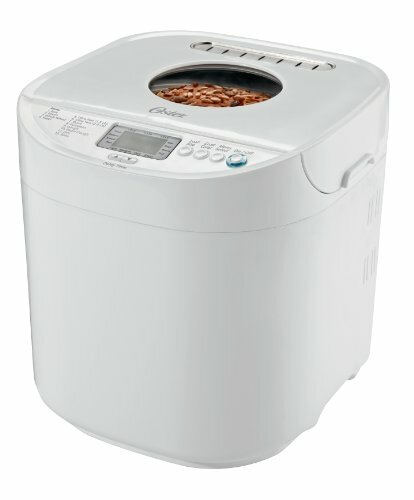 • This bread maker also has a wide variety of different cycles to choose from. The basic, quick, whole wheat, dough and sweet cycles all work perfectly well in producing a wonderful loaf of bread. • The Oster is very durable. For a bread maker that offers a lot of options, it can withstand an almost every day use for up to 3 years or more. • It is very convenient for someone who is in a hurry. Putting all the ingredients in the bread maker takes only 5 minutes of your time then you can do other things while you wait for the bread to bake. • Aside from its simple interface that makes it easy to use, it is also easy to clean. • After a couple of years, the non-stick coating in the pan may start to fall off. • The plastic hinges on the lid may start to soften due to heat when baking bread. • When the bread maker starts mixing ingredients, there is a tendency for the mixture in the pan to spill if you loaded the pan to the full capacity of the bread maker. To avoid this, do not always fill the pan to its maximum capacity of 2 pounds. 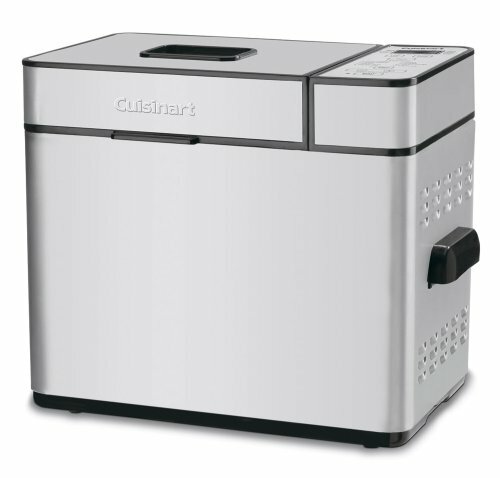 If you are not sure on whether to buy this product, another bread maker that you can check that is also sold below $100 is the Cuisinart CBK-100 2 LB Bread Maker. The Cuisinart has almost the same specifications as that of the Oster bread maker but it has 11 programmable menu options and 3 crust settings to choose from. It also has a 13-hour delay timer and can hold up to 2 pounds like the Oster. A difference that it offers is that it has stay-cool handles which can help you prevent getting burns when using this product. In comparing the two bread makers, they have almost the same features in every aspect. However, the Cuisinart makes for a more worthy choice because of its stay cool handles. Aside from that, it also has crust settings which the Oster bread maker doesn’t have. This is an added bonus if you prefer to have different crust qualities for each bread that you make. For bread makers that are fit for this price range, the best bread maker that our team has reviewed is the Breadman TR2500BC Ultimate Plus 2-Pound Convection Breadmaker. The Breadman bread maker can also produce 2 pound loaves. It comes with 300+ pre-programmed recipes and has a separate dispenser for fruit, herbs, and nuts. It weighs about 17.3 pounds. • Unlike other bread makers, the Breadman has options that enable you to make gluten-free, low-carb, cake batter, pasta dough and pizza bagels. These are options that are not available in its rivals. • The programmable recipes included in the maker are great. Each tried recipe always comes out as a great loaf of bread without fail. • The Breadman also has an option for an extended rise and rest cycle. Not a must, but nice to have. • The white, wheat, quick French, quick white and Amish bread are some of our fave recipes from the programmable menu and all of them have turned great every time. The pizza is really excellent! • It's stainless steel. Since you will want to keep your bread maker for the long term, the stainless steel material of this bread maker makes it an optimal choice. Other bread makers are only made of painted metals which can rust over time. 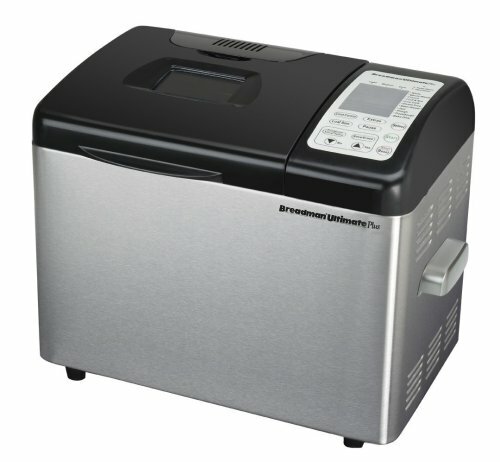 • The controls of the Breadman bread maker are simple and easy to configure. It is one of the best options for a first timer. • It's larger than some other bread makers, but the size of the pan for the bread loaf is just the same. It makes this model seem bulkier. • The display has a low contrast backlight. While there is no problem using that during the day, it is harder to read the settings under dark conditions. There are two contenders in this price range. The first is the Zojirushi BB-PAC20 Home Bakery Virtuoso Breadmaker. The Zojirushi bread maker is large, traditional, rectangular shape that can make up to a maximum of 2 pounds of loaf. It is has a normal baking cycle of about 2 hours and it comes with a measuring cup and spoon. It is also designed with an additional heater on the lid for even baking. • Aside from the manual, it comes with an easy-to-follow instructional DVD. This is also a convenient addition to those who learn by doing. • The lid of the bread maker also comes with a heater, which makes the baked result more even because the heat is more evenly distributed. • The durability of this bread maker is excellent. After 3 years of using it on almost a daily basis, it still shows no signs of wear and is still working perfectly. 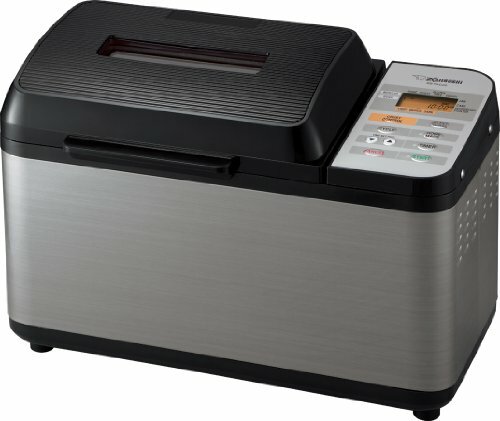 • Even if it is one of the bread makers that are on the expensive side, it's worth every penny. It's also one of the best when it comes to convenience and style. • On the whole it's really durable - except for the paddle design which can cause an overall reduction in the quality of the bread maker over a period of time. • You have to be familiar with manual programming when using this bread maker since its automated settings do not easily produce the perfect loaf. Adjusting the settings will be needed to achieve the perfectly soft and airy loaf. If you are worried about the cons of the Zojirushi, another choice in the same price range is the Breville BBM800XL Custom Loaf Bread Maker. The Breville comes with an automatic fruit and nut dispenser. It also has a collapsible kneading paddle that aims to minimize the hole at the base of the baked loaf. It can bake loaf bread in sizes of 1, 1 ½, 2 and 2 ½ pounds, making it ideal for family sized baking. Lastly, it comes with a manual of 46 step-by-step recipes that aim to result in the perfectly baked loaf. • It has a large maximum capacity, unlike other bread makers whose maximum capacity is only 2 pounds. • The user interface of this bread maker is superior to other bread makers. • Aside from having a viewing window in the lid, it also comes with a light which helps you see through the window in dark conditions so you can easily inspect the baking process. • The control panel of the bread maker is intuitive and easy to use. • It allows extensive customization of the bread making process. The wide variety of options and easy interface makes it easy for you to customize the bread that you want to make. • The collapsible paddle is awful and not as helpful as it claims. It doesn’t help much in baking the bread and its inaccessibility makes the pan more difficult to clean. • The insulation of the machine is poor. Some external parts of it get really hot while it is in use. Best be careful not to touch the bread maker with your bare skin to avoid burns. In comparing the two bread makers, I can say that one has an advantage over the other on both sides. The Zoji bread maker has a more effective paddle system. I prefer the non-collapsible, two paddle system of the Zoji bread maker. However, the controls of the Breville maker are far easier and more convenient to use. Also, I like the Breville more because of the bigger capacity that it can handle. Overall, I would recommend the Breville bread maker. In choosing what bread maker to buy, quality should always come first because it is something that you could be using for a longer period of time on a daily basis. It would be really worth investing in a high-quality bread maker, like the Breville or Breadman, even if it is a bit pricey. 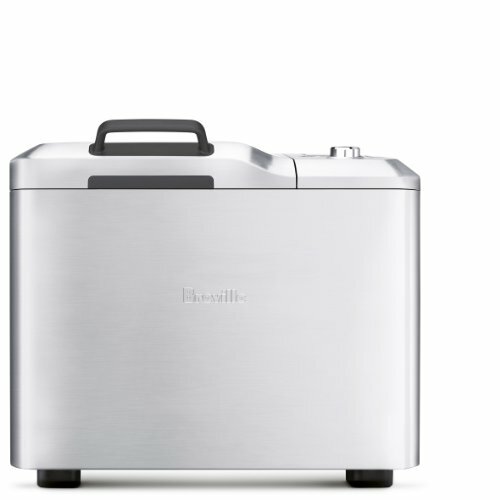 Overall, the best bet for bread makers is still Breville. The pros of this product can always overturn its drawbacks. If you are still not convinced, then you could opt to look for other brands of bread makers. Just make sure to always check the quality and the simplicity of the interface.